A legal challenge against a council’s refusal to grant a licence to a proposed micropub will take place next month. Spinners Square Limited Lancashire is appealing against South Ribble Council’ refusal to grant a licence for the Weaver’s Arms on Spinners Square in Bamber Bridge. It was refused after neighbours objected to the Weavers Arms plan in a former fishing tackle shop with concerns over noise and a potential for anti-social behaviour. A petition from 11 other people from outside the area was also submitted calling for it to be refused. Two outside decking areas were a major concern for neighbours. The council’s own environmental health department has also raised objections. The hearing will take place before Preston Magistrates’ Court on December 11 and 12. A drink-driver was seen speeding and tailgating other vehicles on the motorway. David Gill, a 54-year-old electrician, of Miller Crescent, Singleton, pleaded guilty to driving with excess alcohol. He was sentenced to a 12 month community order with 70 hours of unpaid work for the community, banned from driving for 40 months and ordered to pay £85 costs with £85 victims’ surcharge. Prosecutor, Pam Smith, said on November 3 at 9.20pm a police patrol on the M55 saw Gill in a Ford Fiesta speeding at more than 70mph and tailgating other vehicles. A breath test showed 87 microgrammes of alcohol in his body - 35 is the limit. He had a previous drink-driving conviction from 2012. Conner Cummins, 21, of Fir Oak Close, Preston, was found guilty of dropping litter and must pay a £220 fine, £30 surcharge and £85 costs. Jacqueline Hunter, 56, of The Oaks, Walton-le-Dale, near Preston, was given a rehabilitation activity after admitting stealing books from WH Smith and must pay a £50 fine, £85 surcharge and £85 costs. Mohammad Arif, 64, of Highgate Avenue, Fulwood, Preston, was found guilty of driving without insurance and must pay a £180 fine, £30 surcharge and £85 costs. Simon Grand, 34, of Capesthorne Drive, Chorley, admits driving without insurance and must pay a £346 fine, £34 surcharge and £85 costs. Adam Campbell, 26, of Edenvale Crescent, Lancaster, was jailed for a month after admitting damaging a BMW, and must pay a £115 surcharge. Andrew Moulding, 32, of Birkdale Drive, Ashton-on-Ribble, Preston, was discharged for 12 months after admitting damaging a woman’s front door but must pay £50 compensation, a £20 surcharge and £85 costs. Jamie Scott Robert Coulton, 32, of Alexandria Road, Morecambe, was given a curfew after admitting possessing cannabis with intent to supply it, and must pay an £85 surcharge and £85 costs. Lisa Podd, 35, of Tarnsyke Road, Lancaster, was given a curfew after admitting using threatening behaviour, and must pay £50 compensation. Ian Gray, 39, of Fleet Green, Lancaster, admits dishonestly receiving a stolen trike worth £5,000 and must pay a £120 fine, £30 surcharge and £85 costs. 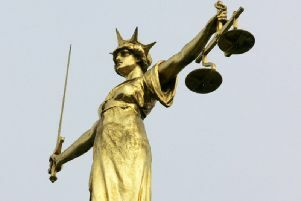 Joseph Taylor, 29, of Gladstone Terrace, Lancaster, admits assault and must pay a £135 fine, £30 surcharge and £85 costs.